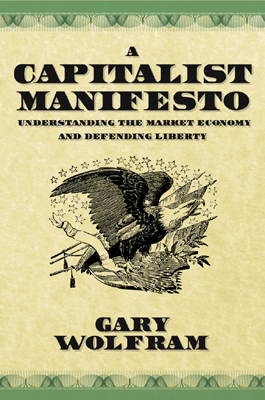 While Dr. Gary Wolfram’s A Capitalist Manifesto is more an introduction to economics and economic history than a manifesto, it communicates economic concepts in a clear and entertaining manner and does so from a market-friendly point of view. Wolfram’s strengths as an educator stand out in this book, which could serve as an excellent text for teaching basic microeconomics and political economy to all audiences. Wolfram is a professor of economics at Hillsdale College, whose course in public-choice economics I attended. The book’s narration greatly resembles my experience of Wolfram’s classroom teaching, which focuses on the essence of an idea and its real-world relevance and applications, often utilizing entertaining concrete examples. The book begins with several chapters on introductory microeconomics – marginal analysis, supply, demand, market equilibrium, opportunity cost, and the effects of policies that artificially prevent markets from clearing. The middle of the book focuses on economic history and political economy – commenting on the development of Western markets from the autarkic, manorial system of the feudal Middle Ages, through the rise of commerce during the Early Modern period, the Industrial Revolution, the emergence of corporations, and the rise in the 20th century of economic regimentation by national governments. One of the strengths of this book is its treatment of the benefits of free trade, from its role in progress throughout history to the theoretical groundwork of Ricardian comparative advantage. Enlightening discussions of constitutionalism and the classical idea of negative liberty are also provided. Wolfram introduces the insights of Ludwig von Mises regarding the infeasibility of central planning in solving the problem of economic calculation, as well as Friedrich Hayek’s famous “knowledge problem” – the dispersion of information among all the individuals in an economy and the impossibility of a central planner assembling all the information needed to make appropriate decisions. Wolfram further articulates the key insights of Frederic Bastiat: the seen versus the unseen in economic policy, the perils of coercive redistribution of wealth, the immorality of using the law to commit acts which would have been unacceptable if done by private individuals acting alone, and the perverse incentives created by a system where the government is able to dispense special privileges to a select few. The latter third of the book focuses on such areas as money, inflation, and macroeconomics – including an exposition of the Keynesian model and its assumptions. Wolfram is able to explain Keynesian economics in a more coherent and understandable manner than most Keynesians; he thoroughly understands the theories he critiques, and he presents them with fairness and objectivity. I do, however, wish that the book had delved more thoroughly into a critique of Keynesianism. The discussion therein of the Keynesian model’s questionable assumptions is a good start, and perhaps a gateway to more comprehensive critiques, such as those of Murray Rothbard and Robert Murphy. A layperson reading A Capitalist Manifesto would be able to come out with a fundamental understanding of Keynes’s central idea and its assumptions – but he would not, solely as a result of this book, necessarily be able to refute the arguments of Keynes’s contemporary followers, such as Joseph Stiglitz and Paul Krugman. Wolfram mentions critiques of Keynesianism by Milton Friedman and the monetarist school, the concept of rational expectations precipitating a move away from Keynesianism in the late 1970s, and the “supply-side” interpretations of the Keynesian model from the 1980s. However, those viewpoints are not discussed in the same level of detail as the basic Keynesian model. "One of the strengths of this book is its treatment of the benefits of free trade, from its role in progress throughout history to the theoretical groundwork of Ricardian comparative advantage. Enlightening discussions of constitutionalism and the classical idea of negative liberty are also provided." More generally, my only significant critique of A Capitalist Manifesto is that it is too brief in certain respects. It offers promising introductions to a variety of economic ideas, but leaves some significant questions arising from those areas unanswered. Wolfram introduces the history and function of the corporation but does not discuss the principal-agent problem in large, publicly traded firms with highly dispersed ownership. To anticipate and answer (and perhaps partially acknowledge the validity of) criticisms of the contemporary corporate form of organization, commentary on how this problem might be overcome is essential. Wolfram explains the components and computation of Gross Domestic Product and the Consumer Price Index but devotes only a small discussion to critiques of these measures – critiques that are particularly relevant in an electronic age, when an increasing proportion of valuable content – from art to music to writing to games – is delivered online at no monetary cost to the final consumer. How can economic output and inflation be measured and meaningfully interpreted in an economy characterized partially by traditional money-for-goods/services transactions and partially by the “free” content model that is funded through external sources (e.g., donations or the creators’ independent income and wealth)? Moreover, does Wolfram’s statement that the absence of profit (sufficient to cover the opportunity cost) would result in the eventual decline of an enterprise need to be qualified to account for new models of delivering content? For instance, if an individual or firm uses one income stream to support a different activity that is not itself revenue- or profit-generating, there is a possibility for this arrangement to be sustainable in the long term if it is also justified by perceived non-monetary value. Wolfram’s discussion of inflation is correct and forms a strong link between inflation and the quantity of money (government-issued fiat money these days) – but I would have wished to see a more thorough focus on Ludwig von Mises’s insight that new money does not enter the economy to equally raise everybody’s incomes simultaneously; rather, the distortion due to inflation comes precisely from the fact that some (the politically favored) receive the new money and can benefit from using it while prices have not yet fully adjusted. (This can be logically inferred from Wolfram’s discussion of some of the “tools” of the Federal Reserve, which directly affect the incomes of politically connected banks – but I wish the connection to Mises’s insight had been made more explicit.) Wolfram does mention that inflation can be a convenient tool for national governments to reduce their debt burdens, and he also discusses the inflationary role of fractional-reserve banking and “tools” available to central banks such as the Federal Reserve. However, Wolfram’s proposed solutions to the problems of inflation remain unclear from the text. Does he support Milton Friedman’s proposal for a fixed rate of growth in the fiat-money supply, or does he advocate a return to a classical gold standard – or perhaps to a system of market-originated competing currencies, as proposed by Hayek? It would also have been interesting to read Wolfram’s thoughts on the prospects and viability of peer-to-peer and digital currencies, such as Bitcoin, and whether these could mitigate some of the deleterious effects of central-bank-generated inflation. Wolfram does discuss in some detail the sometimes non-meritocratic outcomes of markets – stating, for instance, that “boxers may make millions of dollars while poets make very little.” Indeed, it is possible to produce far more extreme comparisons of this sort – e.g., a popular “star” with no talent or sense earning millions of dollars for recording-studio-hackneyed “music” while genuinely talented classical musicians and composers might earn relatively little, or even have their own work remain a personal hobby pursued for enjoyment alone. To some critics of markets, this may well be the reason to oppose them and seek some manner of non-market compensation for people of merit. For a defender of the unhampered market economy, a crucial endeavor should be to demonstrate that truly free markets (unlike the heavily politicized markets of our time) can tend toward meritocracy in the long run, or at least offer people of merit a much greater range of possibilities for success than exists under any other system. Another possible avenue of exploration might be the manner in which a highly regimented political system (especially in the areas of education) might result in a “dumbed-down” culture which neglects and sometimes outright opposes intellectual and esthetic sophistication and the ethic of personal productivity which is indispensable to a culture that prizes merit. Furthermore, defenders of markets should continually seek out ways to make the existing society more meritocratic, even in the face of systemic distortions of outcomes. Technology and competition – both of which Wolfram correctly praises – should be utilized by liberty-friendly entrepreneurs to provide more opportunities for talented individuals to demonstrate their value and be rewarded thereby. Wolfram’s engaging style and many valid and enlightening insights led me to desire more along the same lines from him. Perhaps A Capitalist Manifesto will inspire other readers to ask similar questions and seek more market-friendly answers. Wolfram provides a glossary of common economic terms and famous historical figures, as well as some helpful references to economic classics within the endnotes of each chapter. A Capitalist Manifesto will have its most powerful impact if readers see it as the beginning of their intellectual journey and utilize the gateways it offers to other writings in economics and political economy. Disclosure: I received a free copy of the book for the purposes of creating a review.